SCP-682 shortly after escaping from containment, still recovering from acid immersion. Special Containment Procedures: SCP-682 must be destroyed as soon as possible. At this time, no means available to SCP teams are capable of destroying SCP-682, only able to cause massive physical damage. SCP-682 should be contained within a 5 m x 5 m x 5 m chamber with 25 cm reinforced acid-resistant steel plate lining all inside surfaces. The containment chamber should be filled with hydrochloric acid until SCP-682 is submerged and incapacitated. Any attempts of SCP-682 to move, speak, or breach containment should be reacted to quickly and with full force as called for by the circumstances. Personnel are forbidden to speak to SCP-682, for fear of provoking a rage-state. All unauthorized personnel attempting to communicate to SCP-682 will be restrained and removed by force. Due to its frequent attempts at containment breach, difficulty of containment and incapacitation, and high threat of Foundation Exposure, SCP-682 is to be contained in site [REDACTED]. The Foundation will use the best of its resources to maintain all land within fifty (50) kilometers clear of human development. Description: SCP-682 is a large, vaguely reptile-like creature of unknown origin. It appears to be extremely intelligent, and was observed to engage in complex communication with SCP-079 during their limited time of exposure. SCP-682 appears to have a hatred of all life, which has been expressed in several interviews during containment. (See Addendum 682-B). SCP-682 has always been observed to have extremely high strength, speed, and reflexes, though exact levels vary with its form. SCP-682's physical body grows and changes very quickly, growing or decreasing in size as it consumes or sheds material. SCP-682 gains energy from anything it ingests, organic or inorganic. Digestion seems to be aided by a set of filtering gills inside of SCP-682's nostrils, which are able to remove usable matter from any liquid solution, enabling it to constantly regenerate from the acid it is contained in. 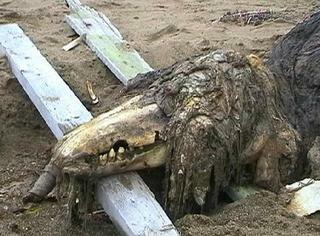 SCP-682's regenerative capabilities and resilience are staggering, and SCP-682 has been seen moving and speaking with its body 87% destroyed or rotted. In case of containment breach, SCP-682 is to be tracked and re-captured by all available Mobile Task Forces, and no teams with fewer than seven (7) members are cleared to engage it. To date (██-██-████), attempted breaches have numbered at seventeen (17), while successful breaches have numbered at six (6). (See Addendum 682-D). Addendum 682-B: Portion of recorded transcript of ██████. Dr. ██████: Now, why did you kill those farmers? Dr. ██████: Speak up. (To Personnel D-085) Move the mic up closer. Dr. ██████: (To Personnel D-085) That microphone has only so much gain, move it closer to it! Log of event 682-E18: Dr. █████ attempts to use SCP-409 on SCP-682. General ███, General ██████, and Dr. ██████████ observing. 0400: Exposure. SCP-682 began to tear at the point of contact, causing massive trauma to the area. SCP-682 requests several times to know what it has been exposed to. 0800: Crystallization begins, spreading much slower than normal. 1400: SCP-682 recovers from exposure, despite the loss of limbs and organs. SCP-682 begins regeneration, stating that it will attempt to kill and consume all staff involved in Event 682-E18. SCP-682 appears to now be immune to SCP-409. Use of other SCP items to terminate SCP-682 must now first be tested on samples of SCP-682 before full-scale testing. In accordance the Dr. ████████'s recommendations (see Document 27b-6), Dr. ███████ and Dr. █████ have requested permission to attempt the termination of SCP-682 using SCP-689. The request is currently pending approval from the ████████. It has also been suggested by Dr. Gears to use SCP-182 in an attempt to communicate with SCP-682. SCP-182 has expressed reluctance, and refuses to enter the containment center of SCP-682, if at all possible.